experimental artist who pioneered the usage of offset lithography and founded Falcon Press. Eugene Feldman was an artist who's innovative and influential use of offset lithography as a fine arts form opened up new possibilities in the medium. By manipulating visual images using print technology available at the time, Feldman pushed the boundaries between offset lithography, collage and photography. 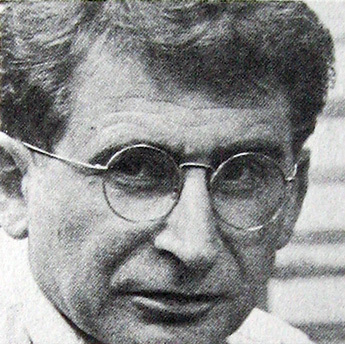 Feldman was the founder of Falcon Press in Philadelphia and Professor of Fine Arts at the University of Pennsylvania. He was active in Philadelphia from the early 1950's until his death in 1975. "Man can make art with a machine; offset press and hand press alike can be his brushes. I try to use my machines as a painter does his brushes. My inks are my paints and the paper my canvas. In graphics, as in any other craft or art, respect for the materials is necessary. I think this respect leads to a desire to explore, to learn what the juxtaposition of type, line, color, space and photograph can create. I'm not sure just where this desire to experiment comes from or why I do it. The pleasure of trying to discover, I suppose, though that doesn't seem an adequate explanation. But I do know that I have a compulsion to probe into the relationship of the elements of printing to each other, to change these relationships and to rearrange them to experiment with the process. Machines, the offset press as much as the hand press, are the extensions of man's hands and talents. Certainly twenty years from now our techniques will be different. Printing might well be done electronically, but its design and composition will continue to offer aesthetic challenges. The materials, whether they be lead type or an electronic tube will be equally worthy of respect." For further information about Eugene Feldman and his art work, please use contact form on contact page.